Do you know your Chopper lump from your Dovetail barrels? During consultation with clients who are interested in purchasing a made to measure side by side shotgun, we often get asked ‘well what’s the difference between the various gunmakers’. To answer this thoroughly we have to understand what is important to our client, an important question on such a considered purchase. So what matters to you and where do you perceive value? For some clients it is the bang for your buck but to others who value hand craftsmanship it is more about the attention to detail of how the particular gun is constructed. In this blog post we’ll focus on barrel construction which for most is a complete unknown. As with any double barrelled gun, the barrels have to be mated together with particular attention to convergence. There are several methods which I will outline below, the end result of getting shot to converge at a the same point over 25-50 yards should be the same regardless of how they are put together. It is worth noting that whilst convergence should be the same regardless of manufacturing method, we have personally pattern tested some guns where the end result for us does not meet what we’d expect to see. Chopper lump: Most people have heard this term but if quizzed would be hard pushed to tell you what it actually means and it is sometimes confused with the similar demi block barrel. Chopper lump barrels tend to be machined/honed which means the tubes have to be soft soldered together as extreme temperatures from brazing can warp/ripple the bore. Each barrel tube is forged to leave half a lump integrally at the breach, two lumps are then braised together to create a set of double barrels. The downside of this is that the internal bore wears marginally quicker than a cold forged barrel which is denser in make-up. The upside is that achieving convergence or altering convergence is easily achieved. 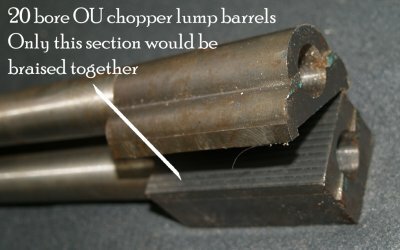 The best English gunmakers such as Purdey, Holland & Holland, Westley Richards et al use this system as Chopper lump barrels can be made to be very narrow across the breach and are the lightest way of constructing barrels, so are generally considered to be the best method of barrel construction. Chopper lump barrels are the most time consuming to get right. You can often spot Chopper lump barrels from a very fine longitudinal line where the lumps are joined, usually visible in the polished bottom of the lump. Demi-block: A variation on the chopper lump is the dovetail lump and credited to Henri Pieper, a Belgian gunmaker. The Demi-bloc barrels are very similar to chopper-lump barrels, but differ from traditional chopper-lump barrels in that the two half lumps incorporate a male and female vertical dovetail. The two lumps slide together and are then pinned and soldered in place. This produces joined barrels that are as strong as chopper lump tubes, although very slightly wider across the breech. This is the method used by both Grulla and Merkel doubles. Again the term demi-block is often misused to describe chopper lump and shoe lump barrels. Shoe-lump: A far easier way to manufacturer barrels than bove chopper, demi-block/dovetail. Literally two full length barrel tubes are brazed on top of a separate piece of steel which is machined with the lump(s) on the bottom. 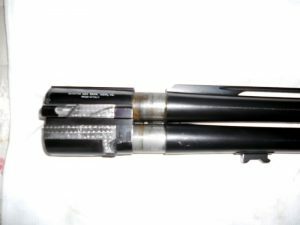 There is nothing technically wrong with this method and it works to great effect although it does add a lot of weight to a gun and means that the barrels are far wider at the breach. You’ll see this method used on inexpensive guns and is now pretty much phased out in favour of the next method of barrel construction. The picture below shows the barrel construction of the Beretta 486 Parallelo (made by Fausti). 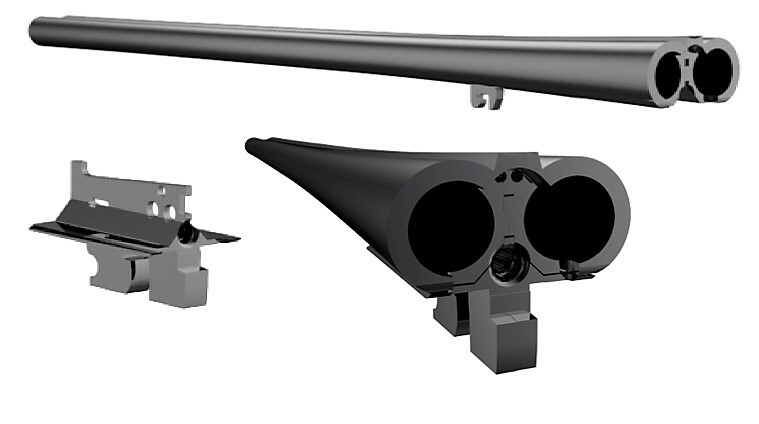 Monoblock: Whether chopper lump, demi-block or shoe-lump, the barrel tubes are full length from breach to muzzle. Monoblock barrels are not. 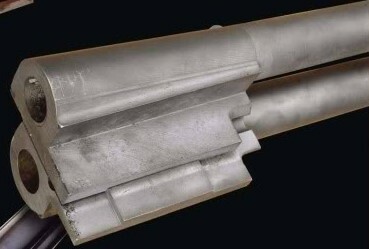 In the monoblock system (developed by Beretta), barrel tubes without chambers are fitted into a steel block machined to form both the chambers and lumps. Such barrels normally have a fine, visible line about 3-4 inches in front of the breech, which is often concealed by a ring of border engraving. Monoblock barrels are widely used in Italy, France and Belgium. The Chapuis Armes shotguns and Zoli shotguns use the monoblock method exclusively across the range. The below shows a failed Beretta monoblock (rare, but it can happen). Our Verdict: With all other elements being equal, the demi-block (dovetailed lump) is the strongest method of joining barrels. The chopper-lump method is considered stronger than barrels joined with a shoe-lump. However, all of these traditional methods of barrel joining work is satisfactory if done properly. The simpler and less labour intensive monoblock system also works well and some superb guns are made this way such as Boxall & Edmiston et al. All Grulla shotguns use the demi-block method of barrel construction. W Horton & Sons have several Grulla in stock in all gauges, see our Grulla shotgun demonstrators. Thanks for sharing different methods of barrel jointing.Has put me wiser on the issue, though I know the different methods but this information refreshed and added to my knowledge.